I wish I knew more about the modeling craze that seems to feature a lot of scooters. I think the idea is that you can create your own action figure and of course that newly minted superhero has to have accessories. These little models come in a variety of colors and are $17.09 each. There is no size mentioned but the company is in California, so it should be easy enough to contact them. Thanks to Julie G. for this unusual find! Yay! 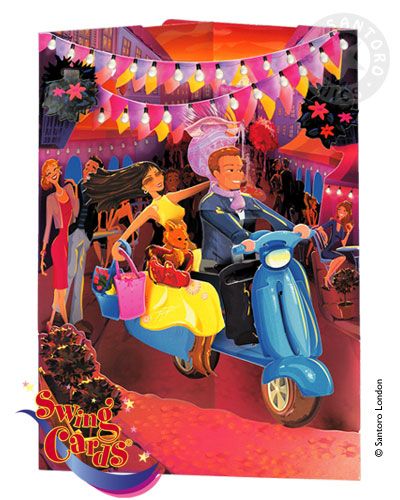 Finally a 3-D pop-up scooter card! Thanks to Julie G. for this amazing find! It’s available in the States via an English stationary company (but of course) for $8.23.